Glen Campbell has been one of my favorite artists for quite some time (thanks to a CD my brother gave me nearly 20 years ago!). He was truly an inspiration to me and so many others... such an incredible vocalist, musician, and a masterful interpreter of songs. I had the chance to see Glen for the first (and last) time at the historic Ryman Auditorium in Nashville, TN on January 3rd, 2012. 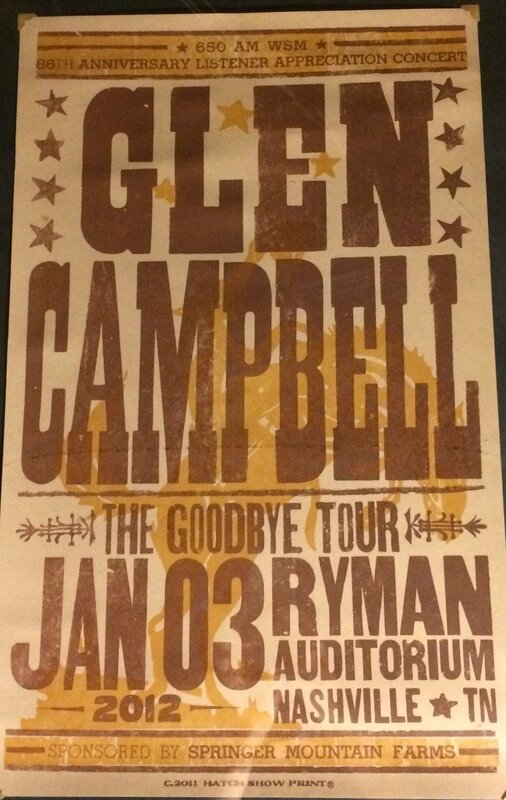 The concert was part of "The Goodbye Tour" and was originally slated for December 5th, 2011, but had to be rescheduled because Glen lost his voice from laryngitis. I obviously felt for him, but I also felt for my brother who'd flown in just for the concert (and unfortunately wasn't able to attend the make-up date). We were steps away from entering the venue when they broke the news so you can imagine our disappointment. Nonetheless, I promised to take a lot of photos at the January concert (see below). I had a seat in the very first row... we're talking a folding chair not in a pew (if you've ever been to the Ryman you know what I mean!). Normally, I would say that's too close; I could reach out and touch the monitor wedges on stage... but in this particular instance it was the perfect seat. Glen's backing band included three of his children, all very accomplished musicians in their own right. Being so close, I was privy to the intricacies of communication, direction, and encouragement between Glen and his children. And there were a lot. Like glue, the band leader and the Campbell kids kept the show together. At times it was unpredictable, but Glen's vocal prowess and virtuoso guitar playing never suffered. He may have stumbled over some lyrics but he hit all the right notes. His guitar solos were mesmerizing. Whenever Glen did get a little off track or confused his children were right there ready and willing to offer a smile, a nod, remind him of the key, or to simply start the song over again (or tell him, "we already played that one, Dad"). I can't imagine the raw emotions they felt up there... knowing the door was closing on not just the music, but also on the relationship they'd had with their father for so long. One word that comes to mind is courageous. Despite the obstacles and everything that could (and occasionally did) go wrong on stage, Glen and his children, along with the other musicians, embraced the spotlight. They did everything they could to keep the music at the forefront, the energy flowing, and the crowd entertained. And we were thoroughly entertained. At one point in the show during "Rhinestone Cowboy" Glen lowered his mic right in front of me, and you better believe I sang that chorus loud and proud! What a vivid moment. I'll always remember that night... the night I sang with my musical hero, Mr. Glen Campbell, at the Mother Church of Country Music. Without a doubt, Glen's story and his vast catalog of music will live on forever. As a tribute to his legacy, I'd like to share with you my version of "Gentle On My Mind" penned by the great John Hartford. It's a true classic, just like Glen. If you'd like to join in the fight against Alzheimer's, you can donate to the Glen Campbell Memorial Fund.